The grandmother and grandfather spirits like ancient recipes. 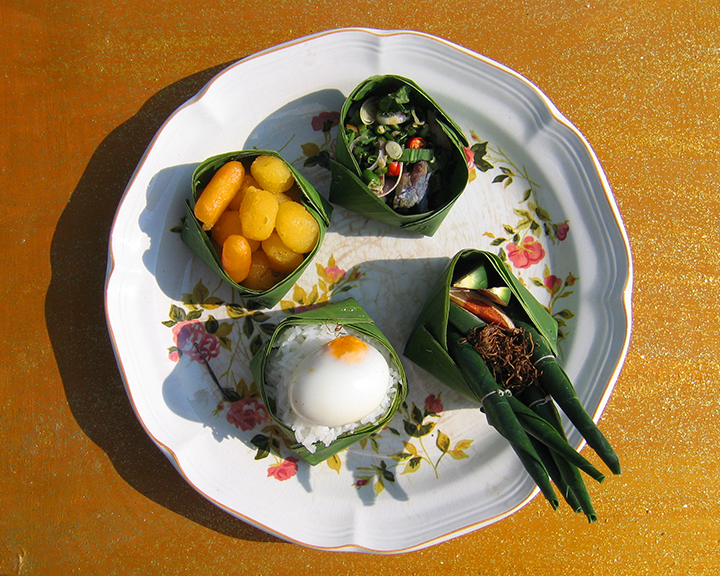 Here is a variety of classical Thai food offerings served in eco-friendly banana leaf cups. This assortment has many layers of symbolism within each item! Fish salad (Yam pla) is known to be a very ancient Thai recipe that consists of chopped and boiled local fish tossed with chili, lime, fish sauce, and onion. This is a standard in ritual fare because of its antiquity. Betel nut (mag bu) is to chew, not swallow and is taken after meals to freshen up the breath. An herbal intoxicant like tobacco, betel is a dying custom that is still chewed by the elder generation and shamanic mediators. Steamed rice with a boiled egg represents the soul-spirit of the rice and the essence of creation. This combination brings abundance. Sweet Egg Yok drops (Tong Yod) are a dessert made from egg yolk and sugar. The name means “abundant gold droplets” and is a symbol of prosperity.